(BOSTON) — An international, multi-institutional team of researchers led by synthetic biologist James Collins, Ph.D., at the Wyss Institute for Biologically Inspired Engineering at Harvard University, has developed a low-cost, rapid paper-based diagnostic system for strain-specific detection of the Zika virus, with the goal that it could soon be used in the field to screen blood, urine, or saliva samples. Building off previous work done at Harvard’s Wyss Institute by Collins and his team, along with collaborators from Massachusetts Institute of Technology (MIT), the Broad Institute of Harvard and MIT, Harvard Medical School (HMS), University of Toronto, Arizona State University (ASU), University of Wisconsin-Madison (UW-Madison), Boston University (BU), Cornell University, and Addgene, joined their efforts to quickly prototype the rapid diagnostic test and describe their methods in a study published online May 6 in the journal Cell, all within a matter of six weeks. Collins is the paper’s corresponding author. 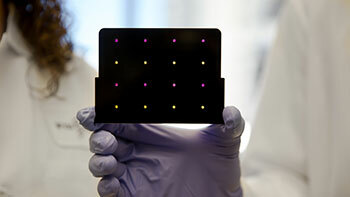 Stirred by the then-ongoing Ebola outbreak in Africa, they demonstrated a proof-of-concept color-changing diagnostic that could screen for Ebola by embedding in paper a novel kind of synthetic biomolecular sensor designed to screen for specific RNA sequences. These RNA sequences can mark not only the genetic signatures of Ebola but also other RNA viruses including Zika, SARS, measles, influenza, hepatitis C, and West Nile fever. The team believed that one day, the method could be applied in the field to identify viruses with blood, urine, or saliva samples. However, until recently, the team’s paper-based technology has been challenged by the extremely low concentration of virus that is normally found in blood, urine, and saliva. Now, using blood samples from monkeys infected with Zika virus as well as virus recovered from cells infected in the laboratory, the team has validated a next generation technique that overcomes this problem. Once a sample’s RNA has been amplified using a mixture of enzymes and “primers”, DNA sequences that trigger replication, a drop is administered to paper discs that are freeze-dried containing a mixture of cellular components and biological proteins. The droplet of amplified RNA activates the freeze-dried components so that the discs will change color to indicate a positive result for Zika virus. While the result can be read with the naked eye similar to a home pregnancy test, a specially designed electronic reader can also be used to get faster results and could, one day, quantify the amount of viral load in a sample. If Zika is detected, the third step involves mixing a sample with a freeze-dried CRISPR-Cas9 cocktail and then using that mixture to wet another set of color-changing paper discs. Depending on the type of Zika strain contained in the sample, these discs undergo another set of visible color changes. Although synthetic biologists and genetic engineers usually put CRISPR-Cas9 to work inside living cells, Collins’ team discovered that it functions just as well – and even better in some cases – when freeze dried. “The ability to recapitulate the genetic machinery of living cells in ordinary freeze dried paper provides a way to develop revolutionary sensors and diagnostics in a fraction of the time and with higher sensitivity and specificity than more conventional assays. These inexpensive paper-based tests also can be easily transported out of the laboratory and distributed virtually anywhere around the world. The potential for applications in health and environmental screening, particularly in low resource areas, is huge,” said Wyss Institute Founding Director Donald Ingber, M.D., Ph.D., who is the Judah Folkman Professor of Vascular Biology at Harvard Medical School and the Vascular Biology Program at Boston Children’s Hospital, and also Professor of Bioengineering at the Harvard John A. Paulson School of Engineering and Applied Sciences. In addition to Collins, Pardee, and Green, additional authors on the May 6 Cell paper (“Rapid, low-cost detection of Zika virus using programmable biomolecular components”) include: co-first author Melissa K. Takahashi, MIT’s Institute for Medical Engineering & Science (IMES); co-first author Dana Braff, Wyss Institute, MIT’s IMES, and Boston University (BU)’s Department of Biomedical Engineering; co-first author Guillaume Lambert, Wyss Institute and Cornell University’s School of Applied Engineering and Physics; co-author Jeong Wook Lee, Wyss Institute; co-author Tom Ferrante, Wyss Institute; co-author Duo Ma, Center for Molecular Design and Biomimetics at Arizona State University (ASU)’s Biodesign Institute and the School of Molecular Sciences; co-author Nina Donghia, Wyss Institute; co-author Melina Fan, Addgene; co-author Nichole Daringer, MIT’s IMES; co-author Irene Bosch, MIT’s IMES; co-author Dawn Dudley, Wisconsin National Primate Research Center and Department of Pathology and Laboratory Medicine at University of Wisconsin-Madison (UW-Madison); co-author David O’Connor, Wisconsin National Primate Research Center and Department of Pathology and Laboratory Medicine at UW-Madison; and co-author Lee Gehrke, MIT’s IMES and Department of Microbiology and Immunobiology at Harvard Medical School, and Harvard-MIT Program in Health Sciences and Technology. The work was supported by the Wyss Institute for Biologically Inspired Engineering, MIT’s Center for Microbiome Informatics and Therapeutics, the Defense Threat Reduction Agency, Arizona State University (A.G.), and the National Institutes of Health AI100190 (L.G.). Link to paper (embargo lifting at 12PM ET May 6, note there may be slight lag time until article goes live on Cell website): http://www.cell.com/fulltext/S0092-8674(16)30505-0. Boston University (http://bu.edu) founded in 1839, is an internationally recognized institution of higher education and research. With more than 33,000 students, it is the fourth-largest independent university in the United States. BU consists of 17 schools and colleges, along with a number of multi-disciplinary centers and institutes integral to the University’s research and teaching mission. In 2012, BU joined the Association of American Universities (AAU), a consortium of 62 leading research universities in the United States and Canada. The Biodesign Institute at Arizona State University (http://biodesign.asu.edu/) works to improve human health and quality of life through its translational research mission in health care, energy and the environment, global health and national security. Grounded on the premise that scientists can best solve complex problems by emulating nature, Biodesign serves as an innovation hub that fuses previously separate areas of knowledge to serve as a model for 21st century academic research. By fusing bioscience/biotechnology, nanoscale engineering and advanced computing, Biodesign’s research scientists and students take an entrepreneurial team approach to accelerating discoveries to market. They also educate future generations of scientists by providing hands-on laboratory research training in state-of-the-art facilities for ASU. AddGene (http://addgene.org) is a 501(c)3 nonprofit biorepository dedicated to facilitating scientific discoveries by operating a plasmid library for researchers. The repository contains over 45,000 plasmids contributed by 2,700 research labs around the world. Over a half million plasmids have been distributed to 85 countries by Addgene – with 11,000 plasmids currently shipping each month. By authenticating, storing, archiving, and distributing plasmids and their associated data, Addgene is creating a lasting resource for research and discovery scientists around the world.